Imagine wearing an earring as thick as your finger. People must have learned to stretch the skin in their ear lobes from an early age. Earplugs were often made out of bone, leather, wood, gold and even jade or turquoise. 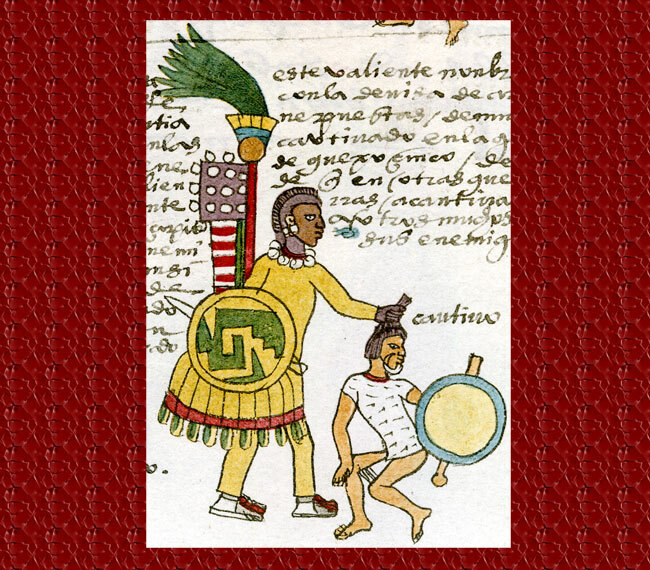 Did Aztec men wear earrings? 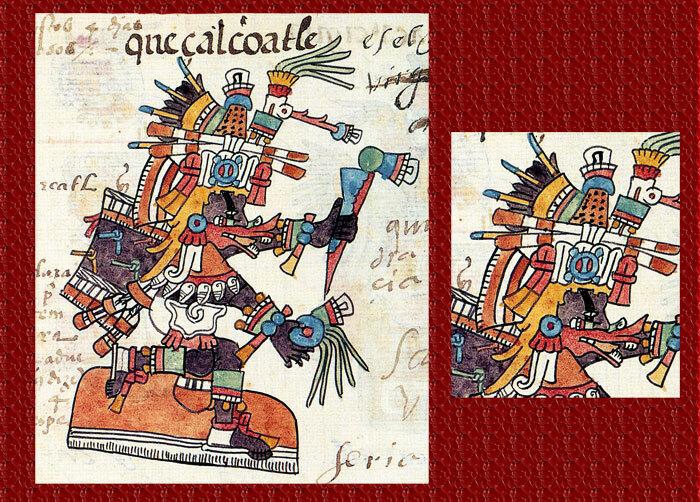 Indeed, Aztec men did wear ornaments in their ears, as well as their noses and lips. What is interesting, though, was what the wearing of this jewellery meant in their society. In pre-Hispanic Mexico, adornments were not just sported for their beauty or to show richness and prestige; each piece of handcrafted metal, stone, leather, bone or wood indicated a social or military rank, and could even have been worn as a religious symbol. Picture 1, for example, shows the goddess Chalchiuhtlicue, patroness of earth-bound waters such as lakes, oceans, rivers and streams. In her ears she wears jade stones, called ‘Chalchiuhuis’ in Náhuatl. Jade was the divine symbol for water. When the Aztecs produced earplugs of jade it’s probable that mainly priests dedicated to the water deities would have worn them. Ear plug in Náhuatl is called Nacochtli. The glyph in Picture 2 is a toponym. Toponyms were painted place names. This one is called Nacochtlan (Peñafiel:1885:147), and means “Place near where there are ears or ear adornments” - an original name for a town! It shows a blue earplug driven through an ear lobe. According to some investigators, green or blue earplugs were related only to the gods, whilst turquoise ones were used exclusively during religious rituals. An Earplug for Every Occasion! Here are some of the earplugs that are represented in the Codex Mendoza and explained in ‘The Essential Codex Mendoza’ by Frances Berdan (on our Panel of Experts) and P. Anawalt. These were a very common shape of adornment for both Aztec warriors, officials and nobility alike. The Codex Mendoza does not indicate what materials they were made of but we do know that their bearers commanded authority. The three examples in Picture 3, from left to right, show an Aztec constable, a dignitary, and two officials who have just strangled a rebellious rural chief. Each of these men wear tubular shaped earplugs of unknown material. The dignitary has next to him a glyph that says his name, ‘Thorn Speech’. He would have been responsible for carrying through special requests made by the emperor. 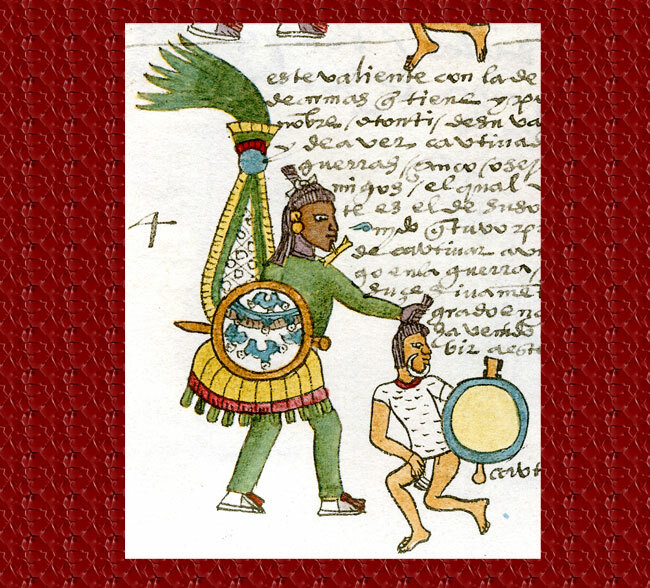 Likewise, the officials to the right are carrying through a sentence given by the Aztec leader. The man you can see in Picture 4 is a superior officer of the Quachic rank. He is wearing tubular white ear plugs that 16th century sources describe to have been made from leather, which was worn as an adornment by this elevated level of warrior. Leather could be dyed any colour. The only earplug that is unique to the Codex Mendoza is the yellow specimen in Picture 5. Although they are the colour of gold, they were probably not made form this all-too-precious metal. The warrior wearing them is of the Otomi rank and would have been considered of too low a status to deserve gold ornaments. Another interesting example of an ear adornment is worn by a midwife, or Temixhuitiani (Picture 7, left). Her earplug is called Xiuhnacochtli, or “Fire Earplug”. The Aztecs sometimes used riddles to describe an object or element. For the Xiuhnacochtli they used this: “What is it that is a horizontal drum of green stone bound about the middle with flesh? 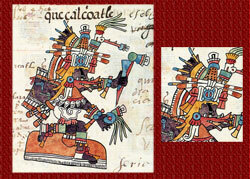 One can see from our little riddle that it is the Xiuhnacochtli”. From the precious turquoise she wears, we can deduce that the midwife was considered to have a job that was touched by the divine, as important as that of any priest. After all, she delivered babies that had been sent by the divine creator deity Ometéotl, ‘Two Lord’, a being both male and female, into the wombs of women. 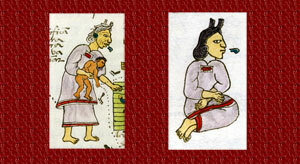 The mother shown on the right in Picture 7 also wears a blue earplug, one identified by Sahagún to be worn by the goddesses associated with childbirth, the Cihuapipiltin. 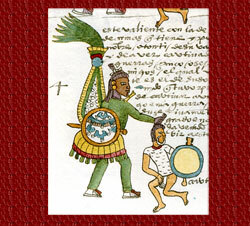 One Aztec god of creation was called Quetzalcóatl-Wind. He dared go down to the underworld to challenge Lord Death, Mictlantecuhtli, and retrieve the bones of humankind. In Picture 8 he wears hooked earplugs called Tzicoliuhqui Teocuítlatl Inacoch. His earplugs are twisted spirals. How to Apply an Earplug! You guessed it, putting in an earplug or nose plug couldn’t have been without its share of pain! Usually both men and women would expand the hole in their earlobes over a period of time, thus allowing their flesh time to adapt to the size of the jewel they were wearing. There are exceptions, however. Legend has it that the emperor Moctezuma Xocoyotzin, on unexpectedly granting a subject the status of chief, had the man’s nose driven through with a thick nose plug, to indicate his new privileged status...painful! • Berdán, Frances F. and Patricia Rieff Anawalt. 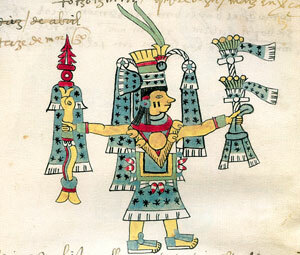 The Essential Codex Mendoza. University of California Press, London, England, 1997. • Macazaga Ordoño, Cesar, Diccionario de Indumentaria Náhuatl, Editorial Innovación, 1983, Mexico. 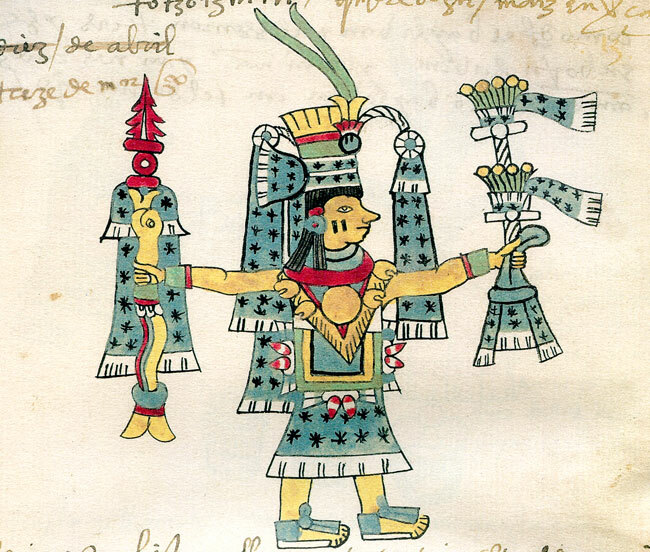 • Peñafiel, Antonio, “Nombres Geográficos de México: catálogo alfabético de los nombres de lugar pertenecientes al idioma Náhuatl. • Sahagún, Fray Bernadino de, Historia General de las Cosas de Nueva España, Prologue by Angel María Garibay, 6th edition, Editorial Porrúa, 1985, Mexico City, Mexico.